When the app Foursquare first took off, people checked in everywhere (including me!). I held brief and hotly contested “Mayorships” of key locations — the corner store, my workplace, literally every restaurant I went to, etc. — and it mattered to me. Years later, event planners are capitalizing on this behavior to facilitate networking and engagement. Why do people check in? “I’ve been doing it for years out of habit, and because I like having a record of my travels,” says Danny Newman, who is a power user of location-based check-in apps like Foursquare and Swarm. When we began researching the concept of checking in, I immediately thought of Danny. He’s a busy guy – CEO of beacon technology company, Roximity, among other things, but he takes the time to check in everywhere he goes, without fail. Checking in is so popular because it hits several of the more powerful human motivators as outlined by game theory. In Danny’s case, he’s collecting mementos of an admirably busy lifestyle, and leaving notes to remind himself and others what he liked or didn’t like about an experience. Check-in apps also use gamification rewards like badges, “Mayorships,” social sharing and more. But he also benefits directly by increasing the chances of valuable and fun networking opportunities. 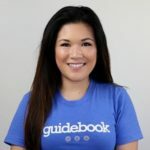 Users who check into events and locations featured in Guidebook’s guides — like conferences, airports and museums — can upload photos to a shared directory (and claim ownership), participate in scavenger hunts, and swap “contact cards” while networking and mingling. They can register for specific mini-events and sessions that are likely to fill up. Without a check-in, these features aren’t accessible. While the thrill of being crowned the Mayor wore off for me years ago (plus, Foursquare did away with mayorships), I still whip out my phone and check in to the Best Fish Taco in Ensenada, a hole-in-the-wall taco joint in LA, because it gives me access to a BOGO deal. And the same concept applies at some events — sponsors and event organizers are offering special perks to attendees who prove they were on-site. It feels good to plant a flag, and everyone else is doing it. When Foursquare launched Swarm, they focused the features on the ability to connect IRL with friends around you. Seeing a familiar face nearby triggers a positive response, and seeing a large number of people nearby — whether you know them or not — makes you feel like you’re part of something special. We also looked into our event check-ins by number of app users and there was a clear pattern — as the number of users increased, the percent of check-ins decreased. Our theory is that when we are part of a smaller event, we feel that we can have more of an impact by checking in and we have the ability to influence the smaller group. But when we’re at a very large event, we find it less important to contribute, plant a flag, or share photos and contact cards. In addition, smaller communities are more personal and less intimidating. You feel like you have control over who sees your information. We know that people come to events to engage and network. The more ice-breaking opportunities early on, and throughout the event, the more likely you are to drive people to meet. Meeting could mean a handshake, a check-in, or a contact card swap. Sarah Michel from Velvet Chainsaw shared ways to incorporate traditional and tech-focused means of encouraging networking. She also calls it “planned serendipity,” and the result is an ice-broken community and a warmer relationship between strangers. At any size event, this is sure to promote check-ins and other interactions. Approach the motivation to check in from all angles. People are incentivized in different ways. Try a check in-only offer or prize, and make sure attendees know they need to be checked in to register for special sessions. If you’re holding a multi-day event, send an email or a push notification reminding attendees to check in on the second day, too. Remind them of check-in only offers and the benefits of joining the community. Interested in using a mobile app to increase attendee engagement at your next event? Try using Guidebook for check-ins, photo sharing, contact swapping and more!